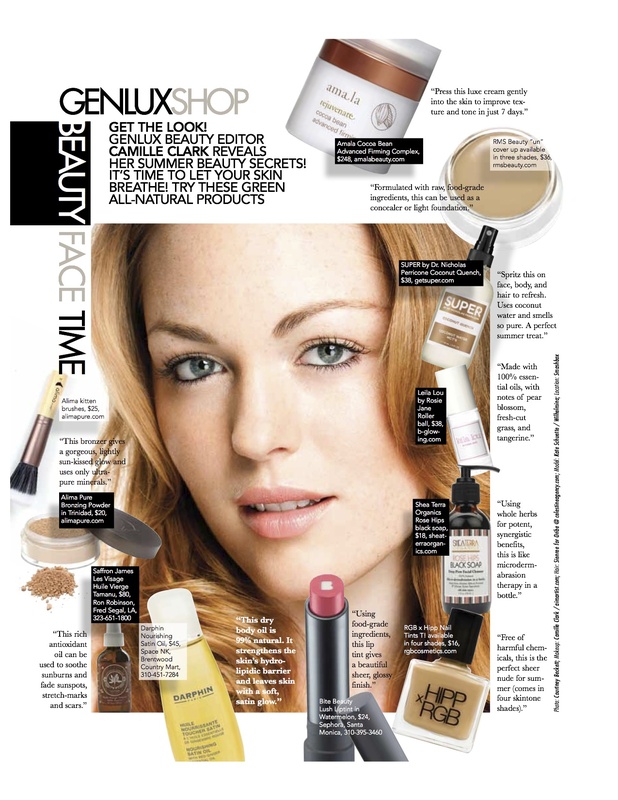 Genlux, a luxury beauty and fashion magazine of Southern California, just released its Summer 2012 issue. Focusing on summer essentials ranging from makeup tips to the best in swimwear, the editors of Genlux lay out everything you need to beat the heat. Beauty Editor, Camille Clark, reveals her beauty secrets, including her go-to concealer: rms beauty “un” cover-up. “Formulated with raw, food-grade ingredients, this can be used as a concealer or light foundation,” says Clark. Because the “un” cover-up is great for building coverage, you can hide both minor blemishes or layer for all-over foundation. Blend with the living luminizer for an extra glow this summer. I, like you, haven’t been able to find a natural mascara that gives me the length and lift I want. I’m worried about using chemical mascara’s regularly, because I’m a bit obsessed with aging around my eyes. Which mascara’s have you tried that have the least of the nasties?